savings from using a smaller, lighter valve. It requires a smaller, less expensive actuator and lighter, less expensive pipe supports. 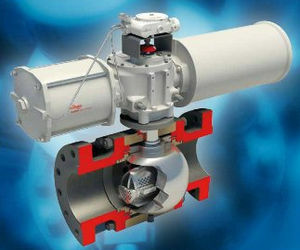 Delivery charges are reduced, and the smaller valve is easier to install in tight piping runs. Rotary seals, precision machining, and accurate trunnion guiding, all contribute to zero external leakage, ensuring that the TMCBV meets all environmental standards. Class 150 – 600# from 6" through 56"
Class 900 – 1500# from 6" through 48"
Class 2500# from 6" through 24"
Control ball valves for severe service class 150 and above 6" through 48"